Using two different studios, two different vintage Rogers drum kits, and a variety of vintage cymbals and snares, Desert Drums gives you the ability to sculpt a truly unique dry drum sound. Go from vintage to modern just by switching the kit, or even combine the elements to add spice and flavor. Kit #1 is a vintage Rogers Holiday ‘68. This beautiful Champagne Sparkle kit has a truly unique 20x14 kick drum with the front skin removed, a 12x8 rack tom that is tuned in 2 different ways to give you a second rack tom, and a 16x16 floor tom. On top of this we sampled a Ludwig Supraphonic 400 and a Slingerland Radio King. Kit #2 is a Rogers Holiday ‘69. This beautiful Red Onyx kit consists of a 24x14 kick drum that will give you a boom that will shake your socks off. The rack tom is 13x9 tuned two different ways to give you a second rack tom, and a 16x16 floor tom. Add a Black Beauty Snare and a Woods Custom Snare and you have a very modern approach to the dry drum sound. Each of these drums were meticulously tuned, dampened, and sampled to give you immense playability. This is all powered by Platinum Samples Accent Drum Engine. Sign up for all things....AWESOME! I never stopped using late '60s drum setups because I can make them into absolutely anything with effects. Thanks Bob! That means a ton coming from you. We are very proud of this library. Last edited by Platinum Samples; 01-11-2019 at 01:28 AM. So odd to see Rail with only 1 post! Believe I saw an ad on FB for Desert Drums... may have to pick them up! 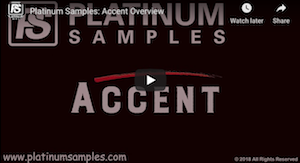 Can never have too many great sounding samples!